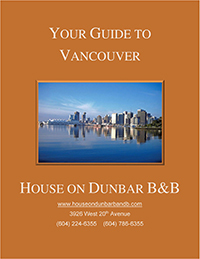 House on Dunbar B&B is located at 3926 West 20th Avenue, in Vancouver BC. Leaving Vancouver International Airport, by vehicle, follow the signs toward Vancouver/downtown which you will see again as an exit labeled as “Granville Street” as you cross the Arthur Laing bridge. Very shortly after exiting, turn left on 70th Avenue which becomes Southwest Marine Drive. Follow South West Marine Drive for several miles until you reach Dunbar Street. Turn right onto Dunbar Street and drive north towards the mountains until you reach 20th Avenue West where you turn left. Continue for 2 ½ blocks to 3926 20 Ave West. Take the Grandview exit from Hwy #1 going west. Stay on this street going across town. It becomes 12th Avenue and further on turns into 10th Avenue. Continue on West 10th and turn left on Dunbar Street (a.k.a. Alma Street). You will snake up this street and then turn right at 16 Ave West. Continue to drive to Crown Street, turn left and at 20th Ave West turn left again. Proceed ½ block to 3926 20 Ave West. The Sea to Sky Hwy. (#99) turns into Hwy #1 or the Upper Levels Hwy. on the north shore of Burrard Inlet. Take the Taylor Way exit south (exit 13), and stay on Taylor Way until the bottom of the hill where you will turn left onto Marine Drive. Stay in either of the two right lanes in order to turn right onto the Lions’ Gate Bridge. You will drive through beautiful Stanley Park, and emerge into downtown Vancouver on Georgia Street. Follow Georgia to Burrard Street and turn right. Follow Burrard through downtown and over the Burrard St. bridge. Stay in either of the two left lanes and at the south end of the bridge follow the left fork which is still Burrard Street. Stay on Burrard and turn right on 16th Avenue going West. Stay on 16th until Crown St. and turn left. Drive to 20th Ave, turn left, proceed ½ block to 3926 20 Ave West. Head North on I-5 and cross the Blaine Border Crossing. You are now on Highway 99, continue Northbound, through the George Massey Tunnel, and over the Oak Street Bridge. As you cross the bridge you will see signs for Marine Drive East (first) and then Marine Drive West (second). Take the second of those exits (S.W. Marine Drive) and after completing the exit, follow the Marine Drive West signs onto Granville Street. As soon as possible, get into the far left lane and turn left onto 70th Avenue which becomes Southwest Marine Drive. Follow South West Marine Drive for several miles until you reach Dunbar Street. Turn right onto Dunbar Street and drive north towards the mountains until you reach 20th Avenue West where you turn left. Continue for 2 ½ blocks to 3926 20 Ave West.